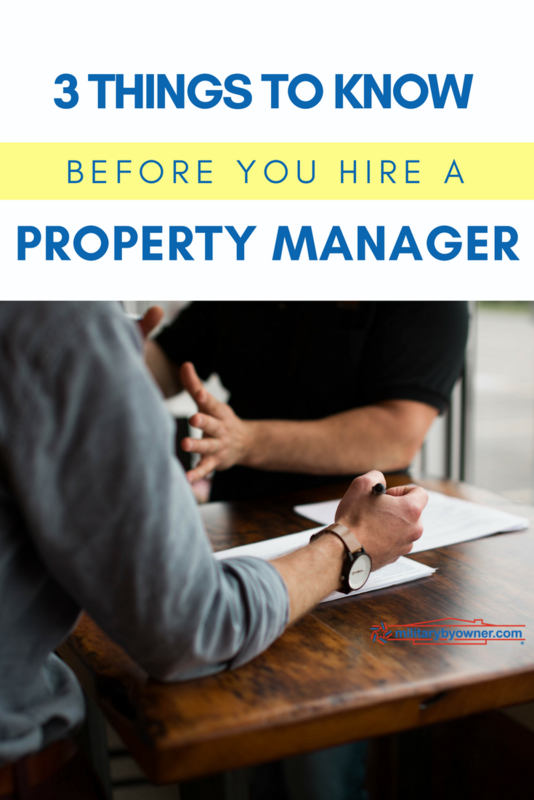 The further a rental property is from your next duty station, the harder it is to manage... and the more you should consider hiring a property manager. Whether it’s a home you intend to return to or its only purpose is to serve as a means of additional income, a rental property needs proper care and supervision. A home is a huge financial investment, and when you choose to lease it out to various tenants, you assume a substantial amount of risk. You may be inclined to hire a property manager if you’re moving across the country, don’t want to be responsible to find tenants, or don’t want to be directly responsible for maintenance and repairs. And while these are all great reasons to hire a property manager, there are some things you should consider before doing so. 1) What a property manager does. Fill vacancies. One of a property manager's responsibilities is to advertise your vacant rental property and find suitable tenants. Screen tenants. Part of finding a suitable tenant is to screen them. In addition to a written application, property managers run credit and background checks and call employers and personal references, to determine that the tenant will both treat your property respectfully and pay rent. Handle the lease agreement. Property managers will sit down with the tenants to review the rental agreement, answer any questions, and sign. Act as the point of contact. Any time the tenants have any questions or concerns, they’ll contact the property manager. Handle move-outs. Instead of traveling back to get a property ready for the next tenant, the manager will conduct the move-out inspection and determine how much of the security deposit should be returned to the tenant. Handle rent. Your property manager should ensure that the tenants not only pay the rent amount each month, but that they also pay it on time. If they don’t, the manager would then be responsible to enforce any late fees or other agreed upon penalties. Maintenance and repairs. The property manager is responsible for responding to tenant calls for maintenance and repairs. You would only be contacted for authorizing a purchase or simply to be informed, depending on your agreement. Keep records. Every month, the manager should provide you with any notes, receipts, and records they have on the the property. Since the services included can vary between property managers, you'll want to find out exactly what's covered. 2) What you’re expected to do. Pay the property manager. Property managers don’t work for free. You’ll need to budget part of your monthly income to pay for their services. You may want to negotiate their monthly cut, but many homeowners and property managers usually settle somewhere between 4% to 10% of the monthly income, depending on the property and how much it’s worth. This fee is typically drawn from the rent collected. Create a fund for repairs. They’ll handle the necessary repairs around the property, and then bill you or draw from your reserve fund (more on that in a minute). You'll want to budget an emergency fund for your rental property. Give up control. 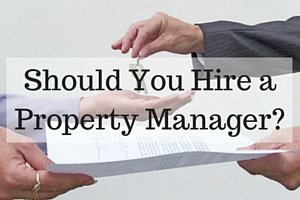 If handing over the reins to someone else isn’t your thing, then you may not want to hire a property manager. Renting your property can mean you have increased liability risk, because injury that occurs to tenants or contractors due to inadequate maintenance can mean the owner is liable. You also risk false allegations from tenants or prospective tenants and fraudulent or illegal behavior on the part of tenants or property managers. You should consult with your insurance broker about needed liability insurance for the property to protect you in the event of personal injury claims or allegations against you as landlord. Follow up. It’s important to establish clear expectations from the beginning. For instance, if a repair is made, require a copy of the receipt and before and after photo of the repair. 3) Then answer these questions. What services do they cover? While the above covers a handful of tasks most property managers cover, your experience may vary. Find out exactly what you’re getting. How many properties are they managing? Coupled with references, knowing how many properties they manage will tell you how many people trust them with their rental and also indicate how focused they will be on your property. How do they handle vacancies? When the property becomes vacant, where does the property manager market the property and what does the advertisement look like? Look for good quality photos, a variety of advertisements, and a listing on MilitaryByOwner, if it’s near a military installation. How’s their communication? Find out their response time, what means they’ll use to reach you, and how often they plan to check in with you. How do they handle repairs and maintenance? Some property managers request a reserve fund that they can use to make necessary repairs or maintenance around the property without consulting you first. The fund is usually somewhere between $250-$500. Once that’s depleted, then the property manager must contact you for additional expenses. You’ll also want to set a maximum amount for one purchase. For example, even if there’s $500 in the fund, the property manager would need to receive your permission to spend it on one item. How often do they plan on checking on the property? Find out how often the property manager plans to not only drive by to do a simple check of the outside, but also knock on the door and ensure the tenants are respecting your home. A casual check every so often can help prevent utter disaster that can occur when left months without accountability. Go with the company that takes the time to listen to you politely and that you feel good working with. They should give you a number where you can easily reach them and treat you like a person, not just customer #243. Ensuring that they’re good listeners gives you confidence that they know your expectations. If you find a manager that constantly talks over you or cuts you off in conversation, then you’re probably dealing with someone who doesn’t respect you, and you certainly don’t want to go into business with them. What fees do they charge? We’ve already established that property managers don’t work for free, but how exactly do they make their money? Ask about initial set-up fees, finding tenant fees, vacancy fees, lease renewal fees, lease renewal, marketing fees, eviction fees, unpaid invoice fees, and, of course, the percentage of monthly income they charge. These fees may sound excessive, but most of them are there to cover the expense associated with running background checks, advertisements, and time. Before hiring a property manager, shop around. Compare pricing, services, and personalities to find the best fit for you. Remember, you’re searching for a professional that you trust to handle a large financial investment.